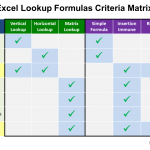 The process for using VLOOKUP doesn’t change much between the two objectives, so we’ll focus on the first objective. In the example below, we have a value called ID circled in blue and a table of data circled in green. The cell highlighted in yellow is the return value, where we are missing a value for State. Essentially, we want to know which State is relevant to ID number “5”. After understanding your objective, it’s important to learn the syntax, or inputs required, to write out the VLOOKUP formula. The syntax for VLOOKUP has changed over time to make it simpler and easier to use. In the latest version of Excel (2010 at the time of this writing), the syntax for a VLOOKUP automatically appears once you type in the formula and an open parenthesis. We’ll look at each component individually. The lookup value is the value we need more information on. In the example below, this is the ID number “5”. We will start by typing our formula in the blank cell where we want to return the missing information. Then we select the lookup value for the first component of the syntax and follow it with a comma. 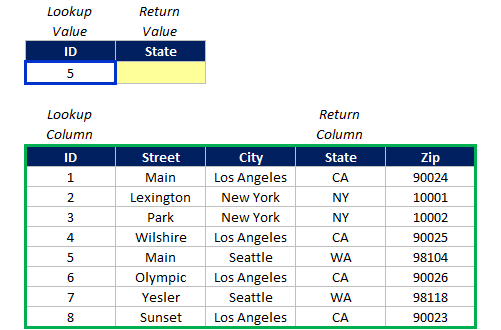 The table array is larger data set where your return value exists. In most cases this dataset will be large enough that you’ll want to use a formula to pull the value, rather than looking it up manually. 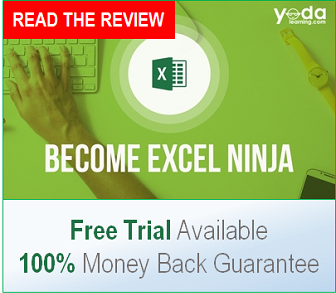 Once you become proficient at VLOOKUP, it also reduces the possibility of making a mistake. 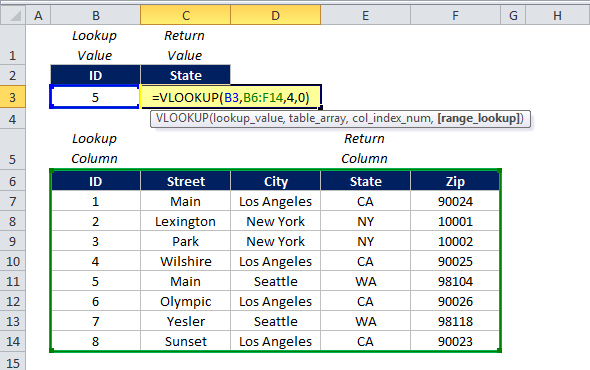 To select your table array, simply click and drag around the entire data set that is relevant to your lookup formula. And again, complete the entry of this component by inputting a comma. This component simply references which column you want to pull back your data from. It’s important to note that the minimum number for this input is 2 – you cannot look up and return the same value (as doing so probably doesn’t make much sense). The maximum value depends on how large your table array is. In the example below, we only have 5 total columns. Therefore, our maximum input for column index number is 5. Inputting any number higher than 5 will return an error value. 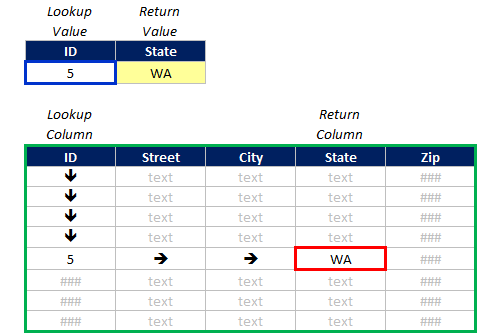 In the example below, since we want to return the State related to our ID, and City is the fourth column in the table array we selected, we input the number “4”. To choose this option, input either a “0” or the word “FALSE”. Many of us who’ve used this formula for years are used to typing in FALSE; the option to put in a 0 is relatively new. To turn on the range lookup functionality, simply do the reverse of the prior inputs, and enter either “1” or “TRUE”. If you simply close off the parenthesis and leave out this final piece of syntax, the formula will default it to “TRUE” and have your VLOOKUP perform a range lookup. 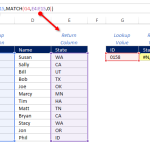 For our particular example, because we want an exact match, we will input “0” so the VLOOKUP does not perform a range lookup. After you’ve written your formula with your desired inputs, close the formula with a “)” and press ENTER to finish writing it. If your lookup result cell comes up with an error, there are a number of reasons why this might have occurred. Over time you will learn how to troubleshoot your errors. 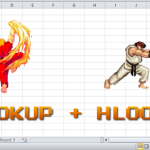 After you’ve mastered using VLOOKUP, you’ll be able harness one of the primary uses of Excel spreadsheets. However, you should not stop this formula; there are other lookup formulas that are superior to VLOOKUP and provide additional functionality. 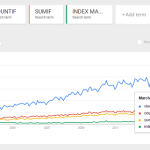 In particular, INDEX MATCH is now the preferred method to perform this type of lookup. 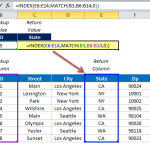 In the paragraph “Column Index Number”, there is a significant error in the following sentence: “In the example below, since we want to return the City related to our ID, and City is the fourth column in the table array we selected, we input the number “4″. In fact it is State which we want to return in the example and which is in column 4, not City. Great tutorial! This helped a lot! Very well explained! 10x a lot! 3. What is the formula would you use to find the youngest student from a range of age? Great job Matthew! Thanks for the explaining in detail! Just a note to say great articles on here regarding lookups but the minimum index number is 1 not 2. I often find it useful to look up the same value. Your suggestion solved my problem with the #N/A issue – thanks for your help! Glad I could help Uttan. I learned vlookup with this post, thanks for your help! Query for col index num. I have data in column DH, which is a lot of columns for me to count. How would i find the number in an easy way? Thank you for my first introduction to VLOOKUP. Easy to follow and understand. Wondering though, in the Table Array, wouldn’t you input B7 instead of B6, since B6 is a header ? Thanks for your help… I will continue to the HLOOKUP now.